Portrait of 15-year-old Jordan Edwards, drawn in one continuous line through the streets around Dallas, starting in the suburb of Balch Springs where police fired three rifle rounds into the car Edwards was riding in while it was driving away, shooting Edwards in the head and killing him on April 29, 2017. Portrait of 7-year-old Aiyana Jones, drawn in one continuous line through the streets of Detroit, starting from where she was asleep on the couch after midnight May 16, 2010, and shot in the head during a no-knock SWAT raid being filmed for a reality TV show, over across town to the church where her funeral was held, to the cemetery where her body is buried, and to the court house where two trials for involuntary manslaughter both ended in mistrials. At the Michigan Fine Arts Competition exhibition, people are following the key points of my "Street Portraits: Philando Castile, Jordan Edwards, and Aiyana Jones," each drawn in one continuous line through the streets around St. Paul, Dallas and Detroit where they were killed. Portrait of Renisha McBride, drawn in one continuous line through the streets of Dearborn Heights west of Detroit, starting from where she crashed her car into a parked vehicle, over to where she knocked on someone's door asking for help, but the homeowner thought she might be trying to break in so he shot her in the face and killed her on November 3, 2013. Portrait of Terence Crutcher drawn in one continuous line through the streets of Tulsa, Oklahoma, starting from Tulsa Community College where he was studying music appreciation, over across Martin Luther King Jr Blvd, and ending where his car broke down and he was shot and killed in the street, September 16, 2016. Portrait of 12-year-old Tamir Rice, drawn in one continuous line through the streets of Cleveland, through the spot where he was shot by police while playing with a toy gun in a park near his home, past where he died in the hospital, past about a half dozen cemeteries where he wasn't buried for 6 months because the medical examiner still had his body, and past the homes of many of the taxpayers who will pay the $6 million wrongful death settlement. 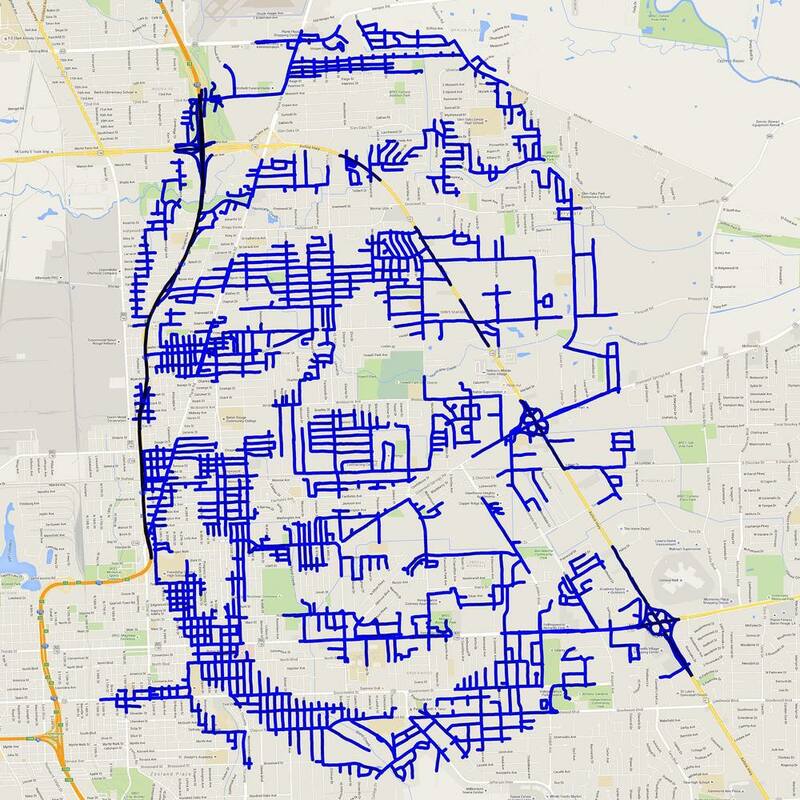 Portrait of Michael Brown drawn in one continuous line through the streets of Ferguson, Missouri, starting from the high school he had recently graduated from, over to where he stole some smokes from a convenience store, down the street to where a police officer first thought unarmed Michael Brown "looks like a demon," then down that street where the officer hit Brown with about 6 of about 12 shots he fired, to where Michael Brown died in that street. Portrait of Philando Castile drawn in one continuous line through the streets of Falcon Heights, Minnesota, a suburb of St. Paul, starting from where he was shot and killed during a traffic stop. Portrait of Eric Garner, drawn in one continuous line through the streets of Staten Island, New York, starting from the point where he was put in a choke hold, where he repeated "I can't breathe" eleven times, past the hospital where he was pronounced dead an hour later, and past the homes of many of the taxpayers who will pay the $5.9 million wrongful death settlement. Portrait of Sandra Bland, drawn in one continuous line through the streets of Waller County, Texas, starting outside her new job at Prairie View A&M University, down University Drive where she was pulled over for failure to signal a lane change on July 10, across underneath Plantation Lake, and ending at Waller County Jail, where she was held alone in a cell, and where she died three days after being stopped over a turn signal, her death classified as a suicide. Portrait of Samuel DuBose, drawn in one continuous line through the streets of Cincinnati, starting from where he was stopped for driving without a front license plate, up Liberty St., up Freeman Ave, up Dr Martin Luther King Dr., to the Church of the Living God where they held his funeral because the police officer shot Samuel DuBose in the head. Portrait of Freddie Gray, drawn in one continuous line through the streets of Baltimore, through the spots where he was stopped, put in a police van, and where he died, just a couple blocks away from MLK Blvd. Portrait of Alton Sterling drawn in one continuous line through the streets of Baton Rouge, Louisiana, starting from the parking lot of Triple S Food Mart where he was fatally shot, through the streets where hundreds have protested, up Interstate 110, through the Martin Luther King Jr. Expressway. June 26, 2017 by .